what is an acceptable fuel pressure drop when my car is turned off and sitting? I recently bought a 2000 Honda Civic EX 1.6 SOHC Sedan to try and build a reliable winter car. I bought it with 74,500 miles on it. When I got the car, I only drove it a total of about 20 miles before putting it up on my hoist and doing everything that I felt I needed too. I put on a new timing belt, water pump, adjusted the intake/exhaust valves, changed power steering pump & leaking rack, changed fuel filter, radiator and put in a set of new injectors. Besides the fact that the power steering rack was leaking bad and shot most of this was just for maintenance because the car is 18 years old. Radiator was really crusty at the bottom and leaking a little. I noticed that when the car sat for a little while and cooled off the engine would not catch immediately when I cranked it. Sometimes it would try and catch and stumble for a second and then start. I looked at scan data and my ECT sensor and IAT seem correct with what environment temperatures are. I thought that my fuel pressure may had been bleeding off into my return line or back through the check valve in the fuel pump. I bought one of the permanent mount fuel pressure gauges and installed it on the output side of the fuel filter, which is mounted on the firewall. Priming the system with the original Honda pump I see 32-35psi at a prime. The fuel pressure did leak down though- after about 10 or 15 minutes you could see it fall a few PSI, and then after about an hour or 90 minutes it went down to zero or close to zero. I blocked off the return line, and measured for the same leakdown- which I saw the same results. I bought a brand new bosch fuel pump, and I picked up a new regulator (more just as a maintenance item as it was cheap)- installed both of those. Fuel pressure is about the same after a prime but it actually looks like to me that the leakdown is a little faster than before- maybe taking 45 minutes or so. I don't think this is a leaking injector problem. My fuel trims are slightly positive (+7%). I also can't smell raw fuel in the intake manifold when I remove the airbox and stick my nose in there. I also removed the vacuum line from the fuel pressure regulator and smelled the side that goes to the manifold and I don't really smell gas like it is leaking into the intake manifold. Don't forget- the injectors are brand new also. I don't think this is a fuel pressure regulator "seat leaking" problem. I clamped the return line going back to the tank and watched the pressure decay just like it does when it is not clamped. Also- the fuel pressure regulator is new. If the diaphragm was torn it would be leaking into the intake manifold and I don't see that either. Plus my trims would be negative. They are positive. I suppose it could be a bad fuel pump check valve- but my fuel pump is brand new. I bought a decent one (bosch) too. The fuel lines under this car ARE in rough shape. They look pretty rusted and will need to be replaced soon. I actually called honda looking to get new lines for the car (I was really surprised because they actually SELL these still!) but I am not sure how hard they will be to install without removing the subframe in the front. I do have a lift in my garage but I don't want to remove the subframe. Sure I could have an externally leaking line- but I don't smell gas. I suppose I could have a pinhole leak but I can't imagine it leaking where I wouldn't smell it. I need to put the car on the hoist and look more carefully. I also want to find a soft spot with rubber hose between the fuel filter and the fuel pump that I can block off and see if the pressure still drops. I am trying to remember if the lines coming right off of the tank are rubber or plastic before they turn into the metal portion. I can't remember. I want to emphasize that this is not a "long" crank time- it just is a little longer than what a new car would have. It sorta "half catches" when it should start- and I get a stumble and then it starts. I haven't tested it in warm weather yet but my garage has a furnace set at 45F over night and this does not help. I'm almost wondering if this much bleed down is normal and I'm on the wrong track. 2 of my other cars have fuel pressure gauges permanently mounted- but they have electrical sending units that won't allow the gauge to work until they are keyed on- so I can't really watch the fuel pressure decay like I can with this mechanical gauge permanently mounted under the hood of the civic. Replied by pole71 on topic what is an acceptable fuel pressure drop when my car is turned off and sitting? Have you cleaned your throttle-body/idle air control? Replied by samsepi0l on topic what is an acceptable fuel pressure drop when my car is turned off and sitting? pole71 wrote: Have you cleaned your throttle-body/idle air control? I pulled off the snorkel tube and I was pleasantly surprised how clean the TB was. I had planned on seafoaming it but I thought I didn't need to after seeing what I saw. The IAC is a bypass that mounts just on top of the TB and I have to check that still. I have a few days off and there are a few things I want to do (maintenance) and that is on the list. Replied by Andy.MacFadyen on topic what is an acceptable fuel pressure drop when my car is turned off and sitting? I wouldn't worry about the leak down it dosen't seem excessive and any case it is how fast the pressure builds up to specified minimum pressure at key on that matters I had a Honda with a similar PGFI fuel system and unbolting the inlet air control valve off the top of the inlet and giving it a good clean with a tooth brush and Q-tip was a two yearly chore. Last edit: 20 Jan 2019 08:59 by Andy.MacFadyen. Andy.MacFadyen wrote: I wouldn't worry about the leak down it dosen't seem excessive and any case it is how fast the pressure builds up to specified minimum pressure at key on that matters I had a Honda with a similar PGFI fuel system and unbolting the inlet air control valve off the top of the inlet and giving it a good clean with a tooth brush and Q-tip was a two yearly chore. Yeah- I doubt this has ever been done. By why is it that once I start it, it restarts fine. I mean "BANG" it fires right up. Today I went into the garage- had the problem at first start. I backed the car up out of the garage and turned off the key (it was still very cold). When I re-fired it it came on strong- just like a brand new car. I have a bunch of things to do this week- including cleaning out the cowl (pine needles) and fixing a water leak in the trunk. I will keep you guys informed. I was planning on going to more drastic measures like hooking up my PICO and recording secondary ignition waveforms during the event to try and see if I have some fouling going on or maybe a lean miss. If I had a crappy weak crank signal I think it wouldn't matter if it was cold or hot. Replied by Tyler on topic what is an acceptable fuel pressure drop when my car is turned off and sitting? Not to dampen the conversation, but I moved this to the Repair section. FWIW, I really like Andy's suggestion about cleaning the IAC. I owned a CR-V for several years that did the same thing you're describing. Finally got sick of it and had a look at the valve itself - found all kinds of nastiness in the screens. Bits of leaves, pet hair, like that. Made me wonder if the previous owner had run it without an air filter! Last edit: 20 Jan 2019 14:24 by Tyler. Tyler wrote: Not to dampen the conversation, but I moved this to the Repair section. You should have seen the pine needles I found jammed behind the drivers side front plastic fender shield when I did the timing belt job. Also- when I heard a noise trying to get heat with the blower turned up high I pulled apart the HVAC and found the entire season of autumn clogged inside between the blower motor and the heat exchanger. It took me 3 hours to clean all of that crap out. I will check the IAC this week for sure. I am not excited about replacing every piece of rubber in the back suspension of the car. It is noisy now. I bought new upper and lower control arms, the trailing arm bushings, and the compensator arms. samsepi0l wrote: I am not excited about replacing every piece of rubber in the back suspension of the car. It is noisy now. I bought new upper and lower control arms, the trailing arm bushings, and the compensator arms. Damn, you've got a project going! I cleaned it out anyway. 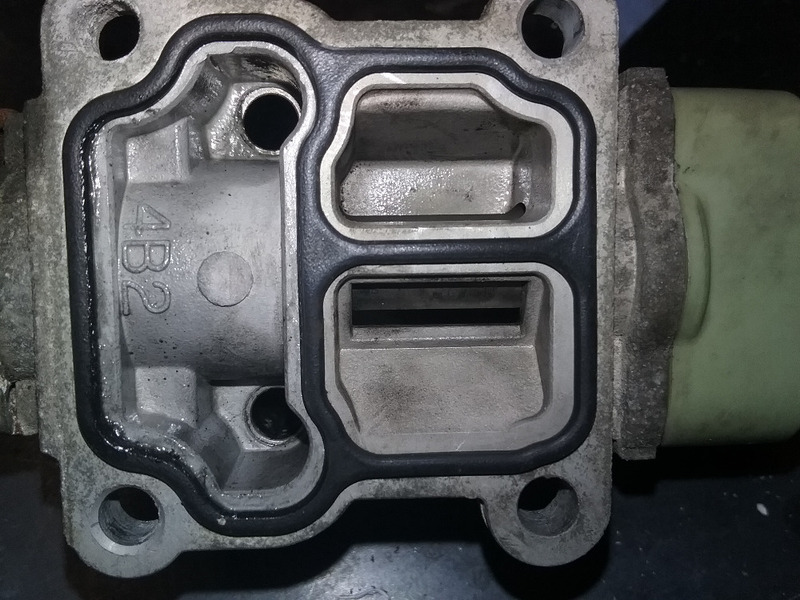 Didn't really notice anything different but I think I need to check my purge valve and see if it is sticking open. Purge should be fully closed during cranking, so I should be able to disconnect the hose and put my vacuum pump on there and see if it will hold vacuum. I think I solved this problem . The issue is that the plugs were getting fouled at startup. 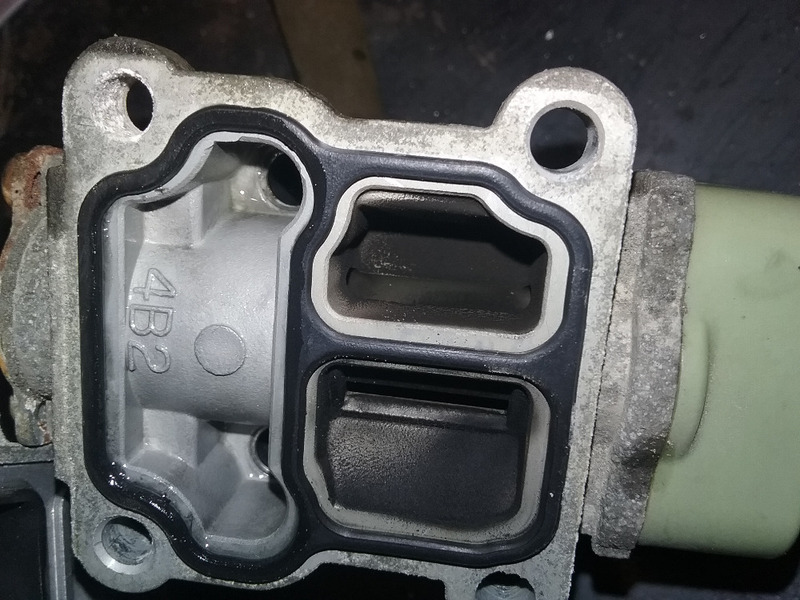 One of my brand new aftermarket injectors was leaking into the manifold creating a puddle of fuel that would get pulled in at crank and cause trouble. I swapped back to the stock injectors and so far it has fixed it. I am pretty sure i am good but of course I want to test it more and get many cranks without problems before saying it's solved. strange that I had positive trims when this was going on. Also strange that these new injectors were bad? These were a brand called "standard intermotor"
Last edit: 09 Feb 2019 19:38 by samsepi0l. This was not a misfire. It did not create a running problem it was only a starting problem.